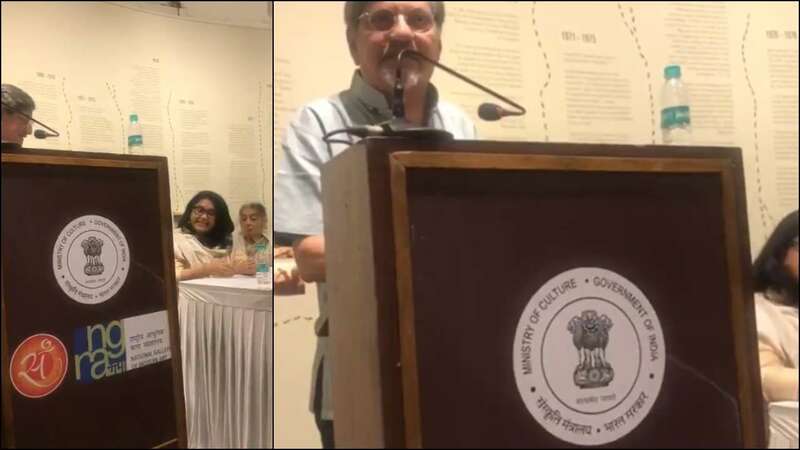 Feb 10 (AZINS) Veteran actor-director Amol Palekar was repeatedly interrupted during his speech by some members of the National Gallery of Modern Art (NGMA) here Friday evening. Palekar was speaking at the opening of an exhibition "Inside The Empty Box" in the memory of artist Prabhakar Barwe. Referring to these reports, Palekar said, "Many of you may not know that this retrospective will be the last show decided by the advisory committee of local artists and not by some bureaucrat or an agent of the government with an agenda of either moral policing or proliferation of certain art commensurate with an ideological incline. "As of November 13, 2018, the artistes' advisory committees at both regional centres Mumbai and Bangalore -- have been abolished, is what I have learnt," he said. He added that he was "in the process of verifying the hearsay". At this point, an NGMA member on the stage, Suhas Bahulkar interrupted, saying that Palekar should talk about the event. To which, Palekar responded, "I am going to talk about the same. Are you applying censorship to that?" He was again interrupted by the curator Jesal Thacker, who said, "This is not needed at the moment, sorry....The function is about Prabhakar Barwe, please stick to that." Palekar continued his speech after the disruption. He said, "This control over NGMA which is the sacrosanct venue for artistic expression and viewing of diverse art is the recent-most casualty in this ‘war against humanities’ as someone recently put it." "I am truly disturbed, and much more disturbed now. Where is it going to stop? This sea of freedom is receding day by day, gradually but incessantly. Why are we silent about this? What is more upsetting is that those privy to such unilateral orders did not speak out, protest or even question it," he continued. According to a report by Scroll.in, director of NGMA Mumbai, Anita Rupavataram denied the allegations made by Palekar saying that new Advisory Committee is 'likely to be constituted in the near future' therefore it would be incorrect of Palekar to say that the Committee has been abolished. According to the news website, in a statement issued on Saturday evening, Jesal Thacker said, "My intention was not to prevent Amol from finishing his speech, but instead only requested him to share more about his anecdotes and fond memories of the artist...Views that are not directly related to the subject of the evening – the art and life of Barwe – can always be expressed at another platform appropriate for that specific concern."